Jokes apart, I had set my eyes upon the immediate Sunday after the CA exams as an ideal day for trekking. Initially, I decided to go to Naneghat on 28th Nov, but then it required detailed planning for which I had very little time. Also, I had never been there before and there was absence of experienced seniors too! So I settled for a place that was easily accessible by train. 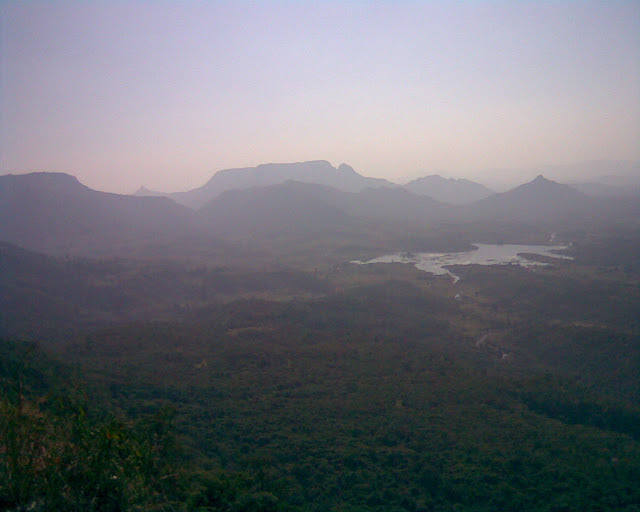 The Matheran mountain range was a suitable place for a day’s adventure. So I randomly selected Chanderi for trekking. I assumed that my fellow CA friends, frustrated just as I was, would be very happy to join me for a trek. But many had already made some other plans. So, there was a weak response to this one. By Thursday, the 25th, hardly anyone had given confirmation. I had very little hopes left but luckily on Friday about 6-7 people confirmed for the trek. Chanderi seemed possible now. However, this was not to be, as by Saturday evening, the number got reduced to just three and once again the trek was under threat!! At this juncture, I remembered the spirit of Podar Hikers Club aptly conveyed by the phrase: “Strike or No Strike-We shall Hike”. 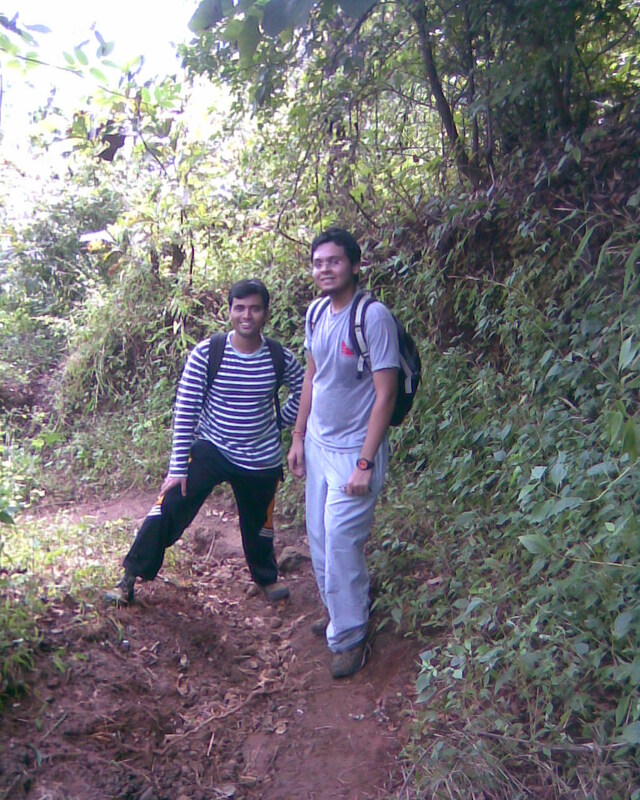 Fortunately, Aman and Ameya did not back out and we three decided to continue with our hike plan. It is human tendency to have a group while going for a trek even if it is a simple one. In my hiking career so far, this was going to be the first hike with the least number of members. This is another amazing thing about hiking. For some hikes, I’ve heard there have been 600+ people, for certain hikes we have had 100 people, 50 people, 20 people, even 10 and 5 but not 3 anytime before this! This is a sort of a record for me. One day I’d like to experience how it is to go for a trek all by myself. The alarm bell went off exactly at 4:30am. It is strange how alert the mind becomes in anticipation of the day’s adventure. Normally I won’t get up even by a 6am alarm and on the day of the trek I got up on time sharp. Amazing truly! I called up Aman and Ameya to ensure they had actually got up and were coming for the trek. Thankfully they were awake and coming. At around 5:10am I was ready and started walking towards Ghatkopar station. I was lucky to find an auto. For college hikes you just have to ensure that you are earlier than the last person to report. But to catch a train you have to be very punctual because a small delay can seriously affect the plan for the day’s adventure. Usually I rely on the people boarding from Dadar for my ticket. But when you are planning the hike, you have to book your own tickets. I was at Ghatkopar station by 5:20am. But the long queue for tickets made me feel tensed. It took 15 anxious minutes to get a ticket. Thankfully, there was still enough time left. The 12-car slow local for Karjat arrived exactly at 5:54am. Ameya had already boarded it at Kurla. Aman got in at Mulund. Considering that we were just 3 of us, I had also planned about Nakhind as a back up. While we were chatting, I told them about my experience of Chanderi trek (which I had done in 2008 monsoon with PHC) and Nakhind trek (which I did in January this year). We were open to both treks, but mutually decided to go for Nakhind. It felt cold as we crossed Kalyan. It was dawn. The Kalyan-Badlapur stretch was covered by early morning fog limiting the visibility and thereby making it impossible to view the mountain range. There was moisture in the air too. All 3 of us were wearing spectacles and we could easily notice the dew settled on our glasses! We got down at Vangani railway station at around 7:15am. Every time I come here I have seen several flower vendors. This is a peculiar sight, which one can probably never miss at Vangani station. Perhaps there might be several nurseries/farms around this area. That’s quite possible, since the Sahyadri Mountains are full of natural beauty. We walked all the way from one end of the station to the other (since we were in the front most compartment. ), exited from the eastern side. We went straight to the nearest open tea stall. We had a light breakfast of Vada Pav/Bhajji Pav and I had Tea. We had a brief chat about Chanderi and Nakhind with the shop owner who told us that a group of about 15 trekkers had already arrived at 6:30am and ventured ahead. We took an Auto to ‘Bedas’ (not sure of the spelling and pronunciation), which is the base village for Nakhind. The auto-wallah confirmed that several trekkers had gone to Nakhind early in the morning. He mentioned that several people come here to enjoy the ‘Bagheera’ waterfall, which he told is quite famous. At around 8am, we reached Bedas. We were applying sunscreen and suddenly I saw a familiar face approaching us. It was that of a poor villager. Without being asked, the old man told us that 12 boys had gone ahead in the morning……and there were 2 girls as well…..”Daha rupaiye dya na”!! Aman was startled. We just moved on and started laughing. In January the same man (probably drunk) had asked us for 10 rupees. Now the actual hike was going to start. For the first couple of minutes it was familiar territory. I remembered the small pond and the small farm at the start. I was eager to make a quick start. But Aman and Ameya were busy chatting about fishing guppies. There was a route in front of us. My intuition said: Yes Parin, this is the one! Go Ahead! (This was actually the right route!) But who knows why, I preferred to take the one to the left. 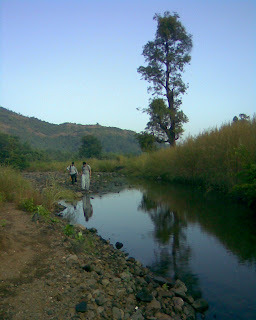 Hardly 10 minutes into the trek and we came across a stream with more pebbles and less water in it. We crossed it and a few moments later encountered it again. The path lay along this ‘pebble-bedded’ stream. It was winding its way through the plains (Yeah, we were still at the base level…no increase in altitude!). On this route, we could see the waterfall (probably the Bagheera waterfall). Thanks to the November rains, it was still active. All this while, I knew somewhere that this path would probably not take us to Waghachi Wadi. We were walking parallel to Nakhind and by now we should’ve taken a right turn. I told Aman and Ameya about it. But I think I am so used to getting lost that I myself did not consider returning back. The proverb “Once Bitten Twice Shy” is not applicable to me. Also the path was enjoyable. But we soon decided to take a right turn. Going further ahead, we reached the waterfall itself! We tried to clear a rock patch but in vain. Aman and Ameya opined,”Parin, apun waterfall mein hi enjoy karte hai…Nakhind ko rehne dete hai”. Now it was nearing 10am and I was determined to find the correct route. So I decided that we should return to the starting point. The last time I had been here, we had not climbed up the standard route. We had discovered a very adventurous “Paul-vaat” (mind you, Bhaji was the leader). Thus, I knew the right route to descend but not the right route to climb up (Abhimanyu’s situation)! After 15 minutes of walking back, we were back to square one! Ameya went to the nearest hut and enquired about the route. Meanwhile, I had identified the correct route (which my intuition had already identified @8am) and started proceeding ahead. Aman and Ameya followed soon. I told them to be quick since we had already lost precious time. (Though even the 2hours spent wandering were actually enjoyable.) Our new target was to reach Waghachi Wadi by 11:30am. 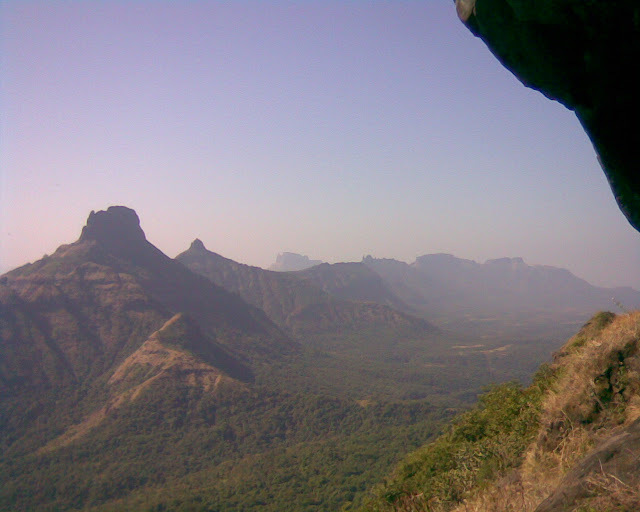 In the Sahyadris, one will find several villages located on the upper plateaus of the mountain. Waghachi Wadi is one such village and is located on the elevated plateau at the foothills of Nakhind. We met a villager on the way up. We got a confirmation that we were on the right track, at last. We three were trekking after a gap of several months and hence even the 20-minute simple climb from the base village up to Waghachi Wadi took a bit longer than normal. But then it’s justifiable considering the fact that we expended our limited energy wandering at the base level. So far we were walking through the jungle and hence didn’t have a complete view of the mountain range but upon reaching the plateau level, we witnessed a grand landscaped view. It was amazing! It felt as if one had entered a whole new world. The ridge of Nakhind stood like a great wall having numerous bumps and troughs on it. A unique feature of this hill is that there’s a hole in the rock, with the wind blowing through it. That was our Lakshya for the day. We could spot it from where we stood although it appeared tiny. Against such a mighty backdrop, lay our first halt. The village had houses in 2-3 groups scattered over the plateau. We managed to reach there more or less on the targeted time. On reaching Waghachi Wadi, we took rest under a big tree in the hamlet. The anxious village kids quickly came out of their dwellings and gathered around us, but were too shy to come closer. They murmured and giggled among themselves. Their behaviour changed as soon as we offered them some chocolates. They smiled as I played a few tunes on my harmonica and they came up with their own rhymes and jingles! (Aage badhte jaunga, shaitan ko haraunga... something like that) It’s always a treat, both for the kids and trekkers to interact with each other. After a few moments of fun and relaxation in the shade, I decided it was time to move further. It required a bit of coaxing in getting my fellow trekkers to start walking once again. It was hot and soon we passed by a kiln where a stack of bricks lay under the sun. The distance between the hamlet and the foot of the mountain is good enough. Although there were numerous gullies running down the hill slope, there was only one that would take us atop. Initially we took up a path that looked promising, but after a 5 minute climb we reached a dead end. It was difficult to negotiate the thorny shrubs and the low-lying branches. I understood this was not the ideal way because the one which is used regularly has to be a clutter-free route. So we came back to the ‘mango’ tree(?) from where we had started the climb. This minor ordeal was enough to trick us into an energy break. We had carried fruits that day which proved to be very helpful. In no time we had slices of apple ready, thanks to the Swiss knife carried by Aman, which were then sprinkled upon by the Glucon-D powder I always carry on hikes. To top it, we had juicy oranges. We were running late already, so I decided to confirm with some locals, but there was no sign of any humans nearby. 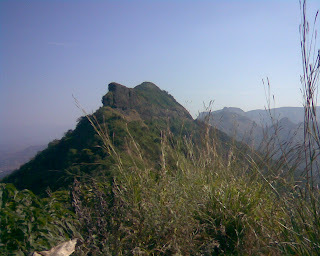 But luckily I could hear some sound coming from the south (direction of Peb fort). Probably some villager was cutting wood. I called out in the direction of the sound: “Aho kaka, koni aahe ka tikde?” Surprisingly, the shouts were answered by a female voice. I took a paul-vaat that ventured in the direction of the sound. Initially, I addressed them as Maushiji but on coming face to face I noticed they were all young village girls. They were gathering timber. I enquired whether the paul-vaat would take us to Peb fort. They confirmed in the positive. I was happy to know their reply since I was very keen on doing the Nakhind-Peb traverse. I determined that the next time I come here I am surely going to give this route a try. I then requested them to guide us about the exact route for the Nedhe of Nakhind. One of them volunteered to show us the exact route. We returned back to the ‘mango’ Trees. She pointed to a tree on the slopes of Nakhind. It was clearly distinguishable from the others as it had yellowish-green leaves. She further informed that a left had to be taken from the tree. This help sufficed for the moment. We thanked her for the help and proceeded to our final destination. And from here on, it was familiar territory for me. I was confident now. On the way, Aman and Ameya had to be reassured of the way especially after I bungled up twice during the climb. Slow and steady we made it to the top. It does give you a high when you reach the summit. Narrow paths on the edge with steep falls on one side are one of my favourites! But this one had them on either side. The last part that takes you to the rock-hole (Nedhe of Nakhind) is a bit risky especially after a major portion of it was washed away during the infamous 26th July 2005 rains. Roughly at about 1 or 1.30pm, we made it to the rock hole. It was already occupied by another trekking group from Dombivli. That explained how they reached Vangani so early at 6:30am. I was too tired to eat anything. Unlike the previous time I was here, we did not get enough space to lie down and relax. So after a short stay, we prepared to get down. Getting down is more fun here. Often one has to slide down literally during the initial few steps. One more thing about the bushes here: you’ll find several thorny plants bordering the trekking path. After trekking Nakhind twice, I still have two unfulfilled dreams: To spend a winter night in the Nedhe of Nakhind just to experience the starry sky and silhouette of Chanderi against the night sky. The second one is to do a traverse from Nakhind-Peb. We returned back to Waghachi Wadi and from there returned to the base. It was around 4pm when we had a refreshing bath in the stream. It was enjoyable to have a bath with cold water in bask evening sun. We took an auto back to Vangani railway station. It being a holiday, we boarded the crowded train with difficulty. All 3 got down at their respective destinations. By 7 or 8pm we were back home already. We did not get to eat a mint with a hole, but we surely relished trekking the Mount with a hole!